Tonight is the Edmonton Guild year end dinner and raffle of the endowment fund Button and Bead goodys. I have donated a glass bead bracelet. I will be buying tickets for some of the other great donation. 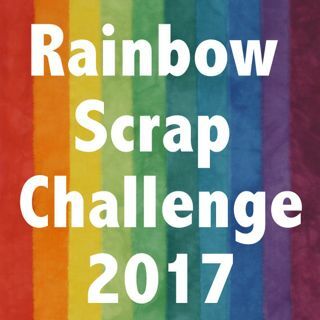 I hope to get some photos tonight of the Button and Bead creations. I have finished this Pray Flag for a quilt friend. I hope that one of the members can take it to her. 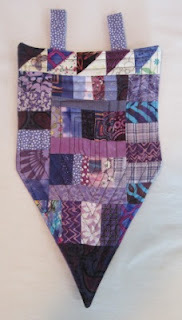 I have been working on my purple scraps this month for the Rainbow Scrap Challenge 2012, and I know that the purple scraps will be well received by the quilter. At our last meeting we were asked to sign a flag for her but I wanted to make something better. I hope that it will let her know I am thinking of her. I like to call this scrap work Poverty Piecing. I have used some of the smallest possible pieces. 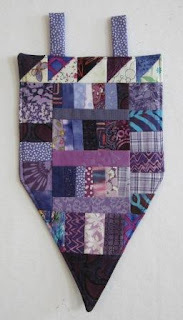 I have added this to Canadian Needle and Thread Network WIP Wednesday and Fresh Lemons WIP Wedensday. There are many other sites to look at. I know I will have to look at more later today. Our quilter friend will love this prayer flag,especially done with the poverty piecing. Have a great time at the banquet. Very nice prayer flags. I'm thinking that this something from out West because I have never heard or seen one before. What do you do with them and where do they hang? I really love the colours! Nice meeting you Cathy.